OMG!!! I have always loved Torico's illustrations and this cutie pie is no exception. I have watercolored the image with Derwent Inktense Pencils for a slightly softer look. The layout for my card is the current Sweet Sunday Sketch challenge. I'm pretty excited because my card also uses the colors from the current Color Q challenge (the yellow is barely visible right at the bottom). 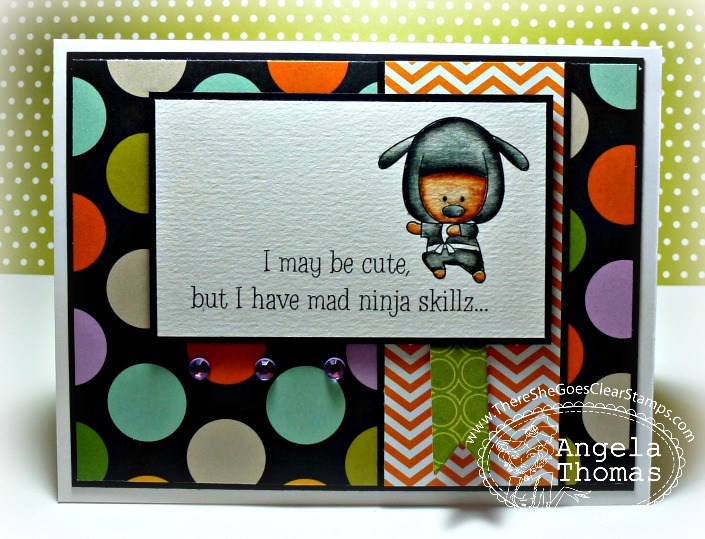 Ninja Skillz is a 6x8 set that includes a total of 26 stamps and will sell for $24.00. Would you like to win the new Ninja Skillz stamp set? Here is what you need to do- visit the Trendsetter’s blogs that are participating in each of the blog hop challenges below and comment on their creations as you go. One of the Trendsetter’s blogs (from each hop day) will be randomly chosen as the ‘it’ blog and a winner will be picked using a random number generator from the comments left on that Trendsetter’s Blog Hop Challenge post. Such a cute card! Love it! And the sentiment is so cute! This is so adorable! I love your coloring and the papers are great! I am loving this set. Great card! Awesome card sweetie! Love how you off-centered the little pup! Your card is SO cute! I'm loving this set!!! Such an adorable image. Great fun card. adorable... that little ninja is too cute. Love the polka dot paper. This is adorable! I love the papers! Fab card! That ninja dog is the cutest thing ever and your coloring is perfect! Your card is adorable, loving the ninja's. Great Design Paper. Lovely Creation...Nice pick of colors....Lil Ninja is very cute ...loved it totally. 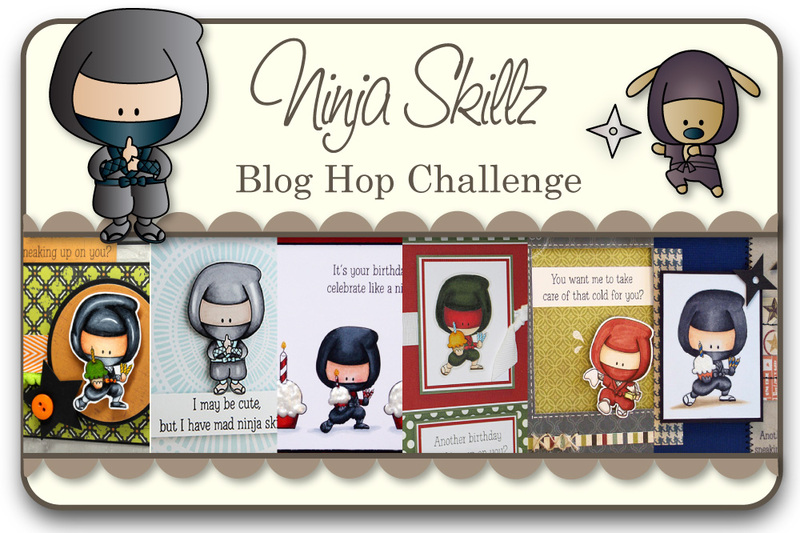 Glad to be a part of Ninja Skillz Blog Hop. OMG .. I love that sentiment LOL My son is always saying how he has Ninja Skillz! LOL I love your card!! Love that little ninja pup LOL Awesome papers! So cute that ninja is awesome. Thank you so much for joining us this week at the ColourQ! I love the way you colored him and the background papers look great with it. Cute card! Love the color combination! way too adoreable!!!!!!!!!!!! i love these colors!! Very cute loving this set already. Great job on your card. That sentiment cracks me up! Nice work. I just adore this set! It's so much fun! This card is soo cute!! Love it! How stinkin' cute! Thanks for playing along with us at colourQ!